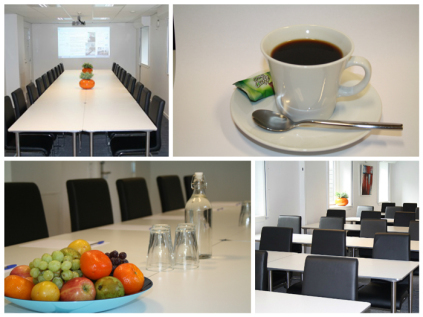 On your visit to Aarhus we offer you the possibility of hosting meetings at Hotel Faber for up to 20 people. When you book a meeting in our facilities we provide coffee, tea, fruit and free wifi as well as AV-equipment. As part of our meeting facilities we offer 4 different lunch-deals including breakfast, lunch, snacks and cake in various combinations. If you order our lunch-deals for your meeting participants you get a 70% discount on the facilities. Our facilities are located in the heart of Aarhus and parking can be arranged both at the hotel (limited parking space) or right next door at a paid parking lot.